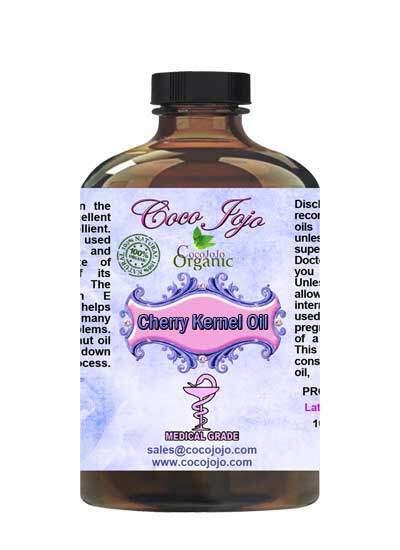 Cherry Kernel Oil 100% Pure Unrefined Pharmaceutical Grade product is Unrefined, which means it is in the purest form that it can possibly be in. 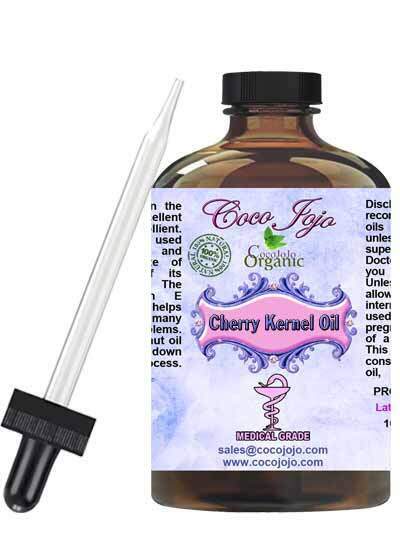 Cherry Kernel Carrier Oil contains natural antioxidants, alpha, delta and gamma tocopherols plus vitamins A & E. It also contains a polyunsaturated fatty acid called eleostearic, a conjugated linolenic acid that prevents UV absorption by forming a barrier on the surface of the skin or hair. Rich in Vitamin A, Cherry Kernel oil is similar to Sweet Almond, however it has a less ‘fatty’ feel making in much more useful for skincare. The high amount of antioxidants, Oleic acid and natural emollient results in improvements to dry skin and refinement in large pores. Cherry Kernel Carrier Oil is a stable, emollient oil great for skin care products and soap making. It can be used as a light, moisturizing oil for lip balms, body butters, salt and sugar scrubs, bath or massage oils as well as soaps and shampoos. It is used in aromatherapy and by massage therapists.